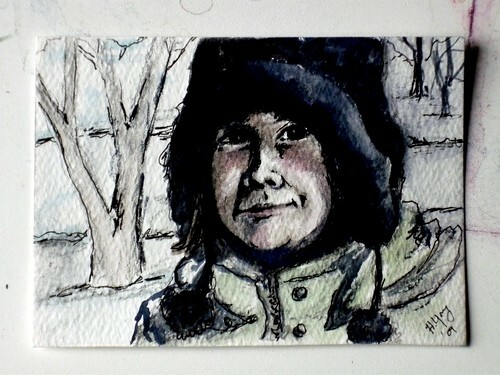 I have a potential project for which I am doing some ACEOs (art cards–2.5″ by 3.5″). I am not going to go into it now in case it doesn’t go through but it is rather exciting to me and I wanted to share the results so far. The ACEOs need to work in black and white so these are ink (Micron pen) with a bit of watercolor wash instead of straight watercolor. The 2 photos down below are actually larger than actual size–which is why I took a few photos with my brushes and whatnot–to give you context. After working on the much larger series it was surprisingly fun to go back to working small scale. Tiny details are fun to do and get lost and forgotten when working larger scale (when I was working on the large series I was too sick of the painting by the time I was at the end to do small details). An ACEO only takes maybe half an hour or so from start to finish including a detailed beginning sketch-which I usually don’t do when working straight watercolor. And yes, as you can see from the photo I like using cheap mechanical pencils (.5 preferably) –I HATE broken pencil led and sharpening pencils and like the crisp line I get from a plain old #2 mechanical. And the gumband on my paint brush is to make it easier to hold–when my RA is bad thsoe tiny brushes are tricky to keep hold of–most of my pencils and brushes have gumbands on them as grips. Yes!! There is nothing like a good ol’ mechanical pencil. :~) I love the texture and tones of these mini’s. I am an artist too, and truly am inspired by your blog that I just found! 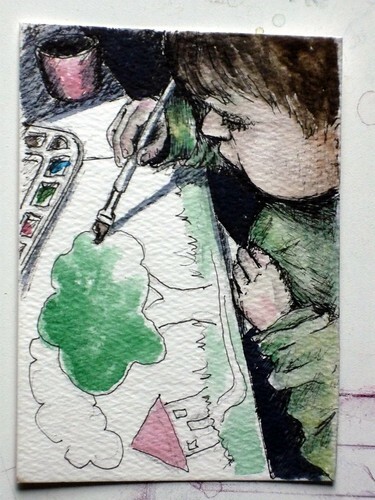 In particular this painting of the child painting a tree. I don’t know… something about it just grabs me. Doesn’t happen to me real often – so it is big when I tell you that I love this one! I can’t wait to come back and spend more time on your blog. I have much to learn!